Spanish is a cuisine that many would agree does not get the exposure it deserves. Spain has such a rich and turbulent history that its food is a delightful mix of competing influences. This makes modern Spanish dining a unique experience focused around a variety of carefully refined dishes. One of Spain’s most famous offerings is paella, a Valencian rice dish that is one of the most famous and widely loved in that region of the world. It is part of the Valencian identity and is considered a signature Spanish dish. Paella party catering is an easy way for anyone to provide this exceptional Spanish dish to their guests. The following discusses the many reasons why this dish is so well suited to social events. As the quintessential Spanish rice dish it is incredibly versatile in the different types of servings it allows. No matter the type of guest an event has, there is a mix of flavours and ingredients that is just right for them. The fundamental ingredients of the dish are rice, saffron, stock and the flavour mix known as soffrito. On top of this any kind of meats or vegetarian/vegan options can be mixed in. Chicken, chorizo sausage, seafood or vegetarian options using mushrooms, capsicums, peas, tomatoes and other vegetables are all popular choices. 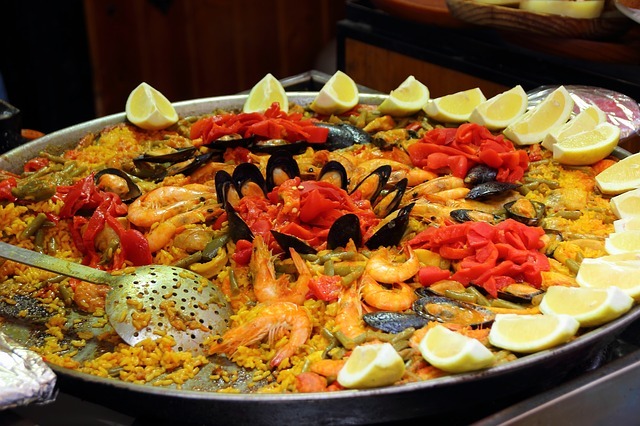 Paella party catering is a perfect way to bring together all the regional and dietary variations of the dish in one place so that there is something to suit everybody’s tastes. One of the primary reasons this dish is so perfect for events with family, friends or colleagues is that it is served as a sharing experience. The large pans are made to allow everyone to dig in and serve the right amount for them. The sizes of each serving pan vary greatly depending on the amount of people who will be present at the event. The measurements of the pans range from 55cm to 1.3 metres across, allowing the dish to be served generously to small gathering of a dozen people to huge events with 150 people and more. Size really does matter when it comes to Spanish cuisine and it’s no different when it comes to paella. There are so many serving options that it makes it easy to cater for any event big or small. At any memorable event people are going to want to take photos to share the experience. Paella’s colourful collage of ingredients looks great on camera, especially when people begin to naturally gather around the pan. There’s no better dish to encourage people to interact as they come back for second and third helpings. This dish is simply perfect for any kind of event that wants to provide a versatile meal that is conducive to social interaction. No matter what the size or tastes of the crowd, paella party catering is a great choice to make sure that everyone has a tasty, fun and memorable experience.